All disputes to be arising from transactions, purchases and contracts with Intechra Consulting Ltd shall be determined and governed by English Law. All goods and products remain the sole property of Intechra Consulting Ltd until paid for in full. Orders placed with Intechra Consulting Ltd shall not be binding unless Intechra Consulting Ltd accepts them. Whilst every effort will be made to effect deliveries and maintain prices quoted, Intechra Consulting Ltd has the sole right to vary prices and deliveries. We do not guarantee delivery times. All goods must be paid for before dispatch, unless otherwise agreed. Payment date must be as stated, all payments must be made in British Pounds GBP. Intechra Consulting Ltd have the right to delay or cancel delivery. 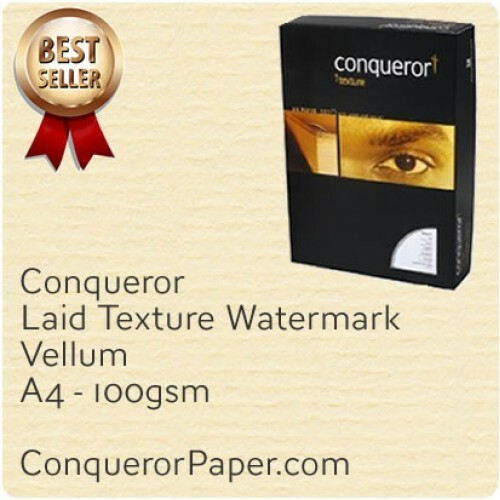 Samples: There is a charge applied to the purchase of samples, which will be refunded in full (including VAT and delivery), only when an order is placed via the same website ConquerorPaper.com registered user account or credit card used to order the samples here on the ConquerorPaper.com website. Refunds will not be given under any circumstances for purchases of Conqueror items made via any other method, retail outlet or website, other than ConquerorPaper.com. Samples are simply as intended, a sample of the product to check for colour and texture with an implied intention to purchase the real product at a later date. This will take the form of 1 item in A4 size, otherwise stated in the sample description as Quantity = Sample. If we do not have your exact sample product item in stock, we will endeavour to notify you about the next best. The price quoted excludes VAT (unless otherwise stated). VAT and other taxes and duties on the goods will be those applying at the time of delivery. However you may not cancel if we receive your notice after the goods have been dispatched and if you cancel the contract, you can have no further claim against us under that contract. If you unreasonably refuse delivery we may charge you for the cost of the delivery and treat your refusal as cancelling the contract. If delivery does not take place, either on the contract date or not at all, because you are at fault or for reasons beyond our control, we may store and insure the goods at your expense. We may deliver the goods as soon as possible, but we have the right to sell them after a period of 14 day's storage. We may, in any event recover our storage and insurance costs. either directly from you or from any proceeds of sale. If we store the goods we may make a monthly storage charge beginnig two calendar months after the date of our original invoice and calculated at 1% of the invoice price of the goods for each month that the goods are not delivered or collected. If you have an approved credit account, subject to status, payment is due no later than 30 days from issue date of invoice, in which the goods were invoiced, unless otherwise agreed in writing. of s6 of the Late Payment of Commercial Debts (Interest) Act 1998.
not pass to the buyer until all monies owed by the buyer are paid in full. You must store the goods properly so that they are clearly identifiable as our property. After your right to use and sell them has ended, to remove them. You must also supply us with samples of any damage or in the event of the goods being incorrect (flap size, window size lack of glue etc). Are free from material defect at the time (as long as you inspect the goods at time of delivery). We are not liable for any other loss or damage (including indirect or consequential loss, financial loss, loss of profits or loss of use) arising from the contract of the supply of goods or their use. Our liability is limited in damages to the price of the goods. We accept no return of printed stock. It is your responsibility to check the quality of stock before printing. You warrant that the specification or designs or materials will not result in the infringement of any rights belonging to a third party and that you will indemnify us in respect of all loss, damage, costs or expenses (directly or indirectly and including finance costs and legal costs on a full indemnity basis) which we may incur in connection with any such claim or threatened claim by a third party. All orders that you place with us will be on these terms (or any that we may issue to replace them). By placing an order with us, you are expressly waiving any printed terms you may have to the extent that they are inconsistent with our terms. Examples of those circumstances include, act of God, accident, war, strikes, governmental regulations or orders, national emergencies, lockouts, fire, flood, drought, tempest, explosion, transport delays and difficulty in obtaining supplies. If for any reason you are unhappy with your purchase you can return it to us in its original condition to our returns address in England, within 10 days of the date you received them (with any seals and shrink-wrap intact) and we will issue a full refund for the price you paid for them less any of our delivery and handling costs. Please Note: We can only accept opened items if they are faulty. Postage will only be refunded on goods which are damaged. Please contact us with 10 days from receipt of your order, prior to making a return so we can issue you with a returns address via email which will carry a timestamp. You must keep this correspondence in the event we need to check the date that you were first in contact with Intechra Consutling Ltd with regards to starting the returns process. The responsibility and costs for returns back to Intechra Consulting Ltd in England, lie solely with the customer and under no circumstances with ourselves. We will not accept the return of printed/used goods unless the goods were defective when delivered. No postage refunds can be issued. No exceptions will be made. Orders that include cutting cannot be refunded and will take an additional 5 to 10 working days for delivery. Goods must be returned as new and unused. Where goods are supplied in sealed packs or containers, the packs or containers must be unopened. This does not apply to bespoke made items The cost of and safe return of the goods to our address in England is the responsibility of the customer. You are advised to obtain a proof of postage from the post office. We are not responsible for the loss of any items during return transit. General Coloured envelopes, card & paper by their nature have a tendency to fade, some colours more than others and in particular recycled papers. It is important when storing or displaying envelopes, card & paper to avoid direct exposure to sunshine or bright lighting systems. Colours may be subject to change. If you are unsure about any of the above please contact us for further information. One of our staff will be more than happy to answer any questions you may have. By ordering from this website or any of the Intechra Consulting Ltd websites via our online order payment facilities or via telephone orders you automatically agree to these terms, if you are in any doubt about your rights please contact us before placing your order. It will not affect the enforceability of any of these terms; and If it would be enforceable if amended, it will be treated as so amended. All brochures, catalogues and other promotional materials are to be treated as illustrative only. Their contents form no part of any contract between us and you should not rely on them in entering into any contract with us. Any notice by either of us which is to be served under these terms may be served by leaving it at or by delivering it to (by first class post or by fax) the other’s registered office or principal place of business. All such notices must be signed. All products with a Product Code ending in C, are cut by a third party vendor here in the UK. 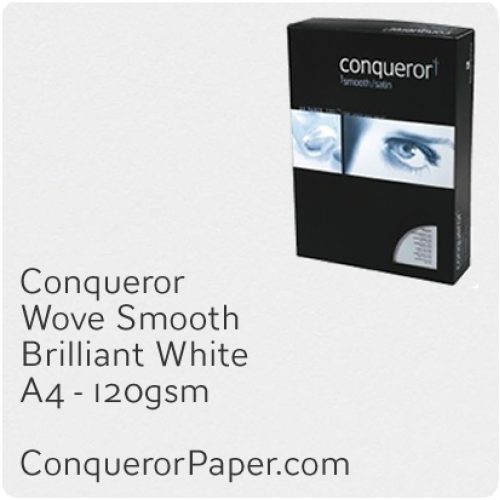 We are a third party supplier of products owned and manufactured under the Conqueror trademark by Arjo Wiggins. The intellectual property rights for all elements of the design and content of this document remain with Intechra Consulting Ltd.
© Intechra Consulting Ltd. All rights reserved.